Observers were impressed when the number of mobile health apps reached 100,000 in Q1 2014. Today, that number has more than tripled and stakeholders within the health industry are embracing mobile health solutions. That’s according to a new report from Research2Guidance, an advisory and market research company focused on the mHealth app ecosystem. For the past seven years, Research2Guidance has published an annual report that explores developments in digital health, including how successful mHealth app publishers are operating, how the market is changing and where mHealth is headed. While the early hype around mHealth has slowed down, the market for health apps is still growing and changing fast. The recent report provides a useful retrospective on the nearly 10 years since Apple launched its App Store and paved the way for mHealth as we know it. Here are 10 takeaways from the latest Research2Guidance report on trends in mHealth. The market for mobile health has been growing steadily over the last few years, and continues to do so. In 2017 there are 325,000 health apps – including health & fitness and medical apps – available on all major app stores. 2. 78,000 new health apps have been added to major app stores in the last year. This year’s health app growth is fueled mostly by new Android apps. 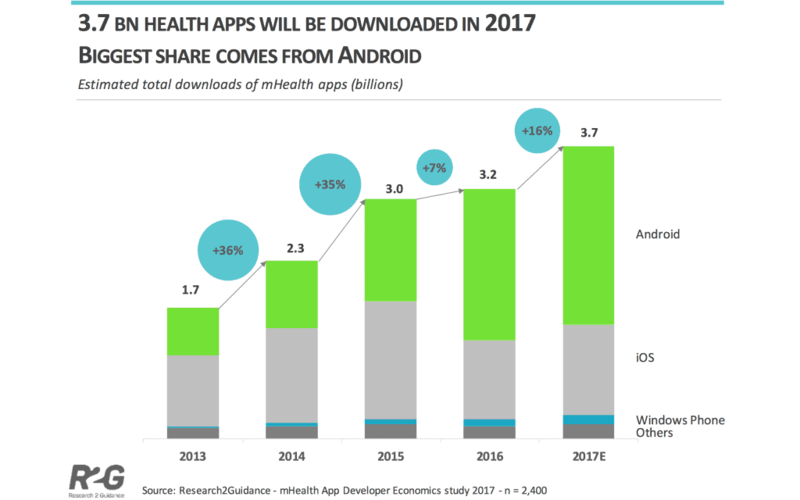 The number of Android apps grew 50 percent from 2016 to 2017, compared to a 20 percent increase in iOS health apps within the last year. Android has now overtaken iOS as the number one platform for health apps and has the most mobile health apps of any app store. The 325,000 health apps available for iOS and Android are expected to see 3.7 billion downloads in 2017. That’s a 16 percent increase from 2016, compared to a 7 percent increase from 2015 to 2016. This higher growth rate in 2017 will lead to half as many health app downloads as there are humans on planet earth. The growing number of apps is fueled by a 45 percent increase in app publishers since 2016. This year more than 84,000 app publishers are developing apps for the medical and health & fitness market. While there are more health apps and publishers than ever before, growth rates for downloads have slowed compared to several years ago. Research shows that most people with smartphones use less than 20 apps, so getting new downloads can be tough. 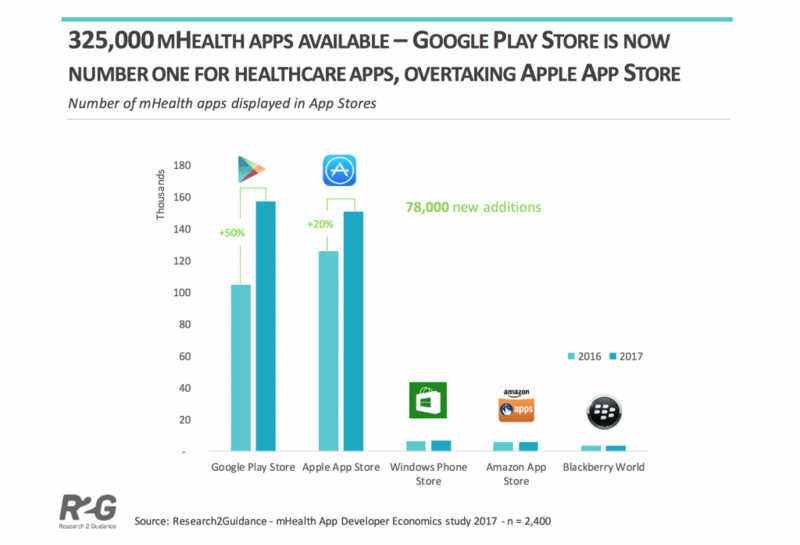 With more developers and slowing download rates, the gap between health app demand and supply is widening. In addition to a growing number of app publishers, the market for mHealth apps is fueled by the growth of start-up companies fed by early-stage investments from accelerators, incubators and Venture Capital Firms. Early stage investors – primarily US Venture Capital Firms – invested approximately $5.4 billion globally into digital health start-ups in 2016. It’s looking like 2017 will exceed this annual figure, potentially making 2017 a record-breaking year for digital health. According to last year’s survey, nearly one in five app developers (18 percent) say that strict and often complex regulations are one of the biggest reasons for the slow development of digital health solutions. But a recent FDA announcement may initiate a new paradigm in how digital health is regulated in the US. Proposed in July, the agency’s Digital Health Innovation Plan would shift the regulatory process so that entire companies, rather than individual digital products, could be approved. This pre-approval of selected companies could speed innovation and serve as a blueprint for other countries. About one-third of the digital health industry is occupied by purely digital market players – mHealth app companies and accelerators or incubators with “digital-only” business models. This was the largest group of respondents to the Research2Guidance Survey, followed by traditional healthcare stakeholders including medical device companies, pharmaceutical companies, health insurers, hospitals and telehealth services. Many traditional healthcare companies are using mobile health solutions as a digital extension of their core business. When it comes to digital health markets, surveys show that size matters. 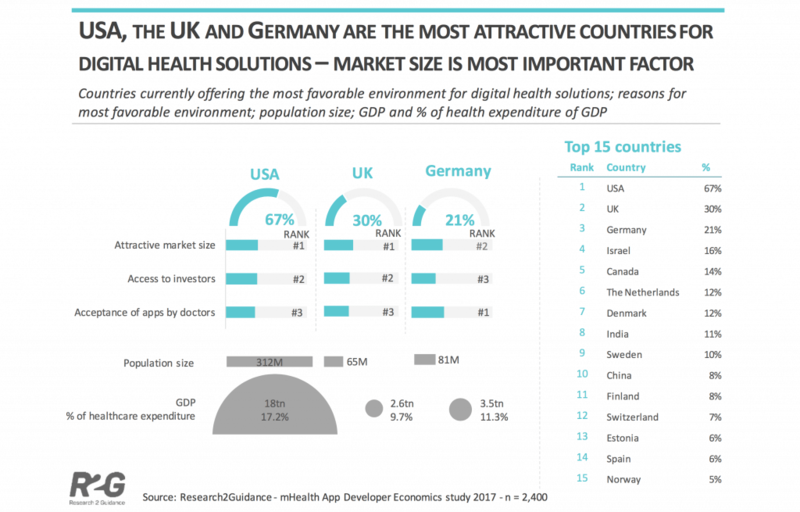 The US and UK were ranked as the most attractive places to develop mHealth apps because of their “market size,” “access to investors” and “acceptance of apps by doctors.” Germany was ranked third. While app publishers tend to pick their own country as attractive, the US was still clearly ranked as the leading country when it comes to favorable digital health environments.